La Commune de Paris is the first example in modern history of an occupation where workers take take control of their own city and form a progressive democratic assembly of the people. 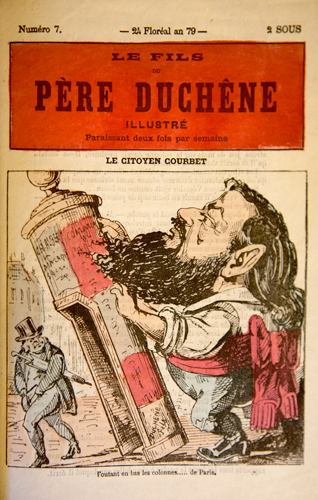 It lasts from March 18 to May 28, 1871 before being brutally destroyed by the French Government. 1870 - Paris is besieged by the Prussians. The gap between rich and poor widens. The French government under Adophe Thiers is only concerned with the interests of the capitalists who want to keep their property safe. To this end, the goverment willing to make a deal with the Germans. February 1871 – Working people decided to take matters into their own hands. They join together with members of the National Guard, the citizen soldiers who have been defending Paris. Together they take the guns into their own neighborhoods. In fact these cannons were paid for by the people themselves so they rightly believe that they own them. 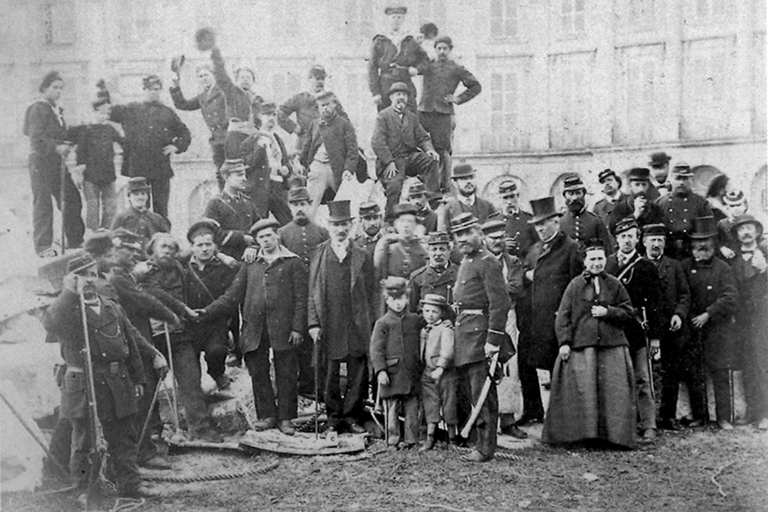 When the government sends in the regular army to retrieve the weapons, many soldiers refuse to obey orders and join the people of Paris. The national government, the police and bourgeoisie flee to Versailles. The people of Paris hold elections. Many left wing citizens including Socialists and Republicans (that is those were against Monarchy) come together to form the Commune. They take down the French tricolor and raise the red flag. The Commune starts organizing public services essential for a city of two million. They reach consensus on new ideas for a progressive, secular social democracy. This includes separation of church and state, universal suffrage, the people’s right to have a roof over their heads. They believed that higher education and technical training should be free and open to all. Women join the clubs rouges and identify with the socialist politics of the exploited worker against the capitalist profiteer. Men are shocked at being contradicted and even shouted down. They called them hyenas, viragos and whores. The working women, seamstresses, street vendors and sweatshop workers are determined to make their voices heard. They start clubs for women only. They believe that the struggle against patriarchy can only be pursed through global struggle against capitalism. The Women’s Union demands gender equality, equal wages, the right of divorce for women, the right to secular education and professional education for girls. The also demand that a distinction no longer be drawn between married women and those living with their partners and between legitimate and illegitimate children. They advocate for an end to prostitution. They organize cooperative workshops and a cooperative restaurant Le Marmite that serves free food to homeless people. For the first time in history the Commune implemented their demand for equal pay for equal work when female teachers are paid the same as the men. In the end women fight heroically on the barricades to defend their new found freedom. 13 April - The Manifesto of the Federation of Artists proposes that Art should be run by artists, free of commercial considerations, and promises without exception to preserve the treasures of the past, to illuminate the work of the present and to educate for the future. Plans for a program of exhibitions and a journal are established and teaching reforms instituted. Now the national government and its bureaucrats have fled, people form their own local organizations to take care of themselves. They set up first aide stations. In one neighborhood children receive free food and clothing, in another they are given free school materials. The Commune is fully committed to internationalism and believes that working people everywhere in the world have the same interests at heart. At the instigation of Courbet, the citizens tear down the Vendome Column, a symbol of the imperialism of Napoleon. At first trade unions from all over Europe send their good wishes and support. Most of the Communards believe in non violence and leading by example. They believe if the rest of France knew what they were doing, they would join them. The French National government in Versailles cuts off communication between the people of Paris and the rest of France. The Communards cannot get their message out. Both the German Empire and French government are united in their hatred of the Commune and all it stands for. The Germans release POWs to the French government who send them to "liberate" Paris. Working people defend themselves against government forces, building barricades with whatever they have to hand including sandbags, old doors and furniture, whatever they can find. The violence of the government is overwhelming, even woman and children are shot by the soldiers. The People retaliate by burning down government buildings including the City Hall. 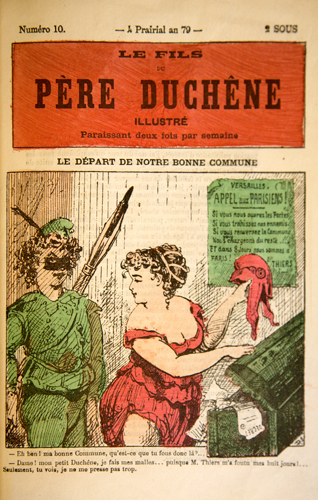 Fighting cumulates in La Semaine Sanglante (the bloody week) of vicious street fighting. The poor working class districts fight to the end May 28th. 30,000 people are massacred. Government reprisals now begin in earnest. Anyone who supported the Commune is considered a criminal. Many are executed, nearly 40,000 marched to prison at Versailles including whole families, to be killed, imprisoned or deported. Some escape. Though the Commune lasted for one brief spring a hundred and forty years ago, their ideas about how to live together with equality and sharing, with reason not force, their belief that together we ordinary citizens can change our world, are just as alive and urgent today as they were then. 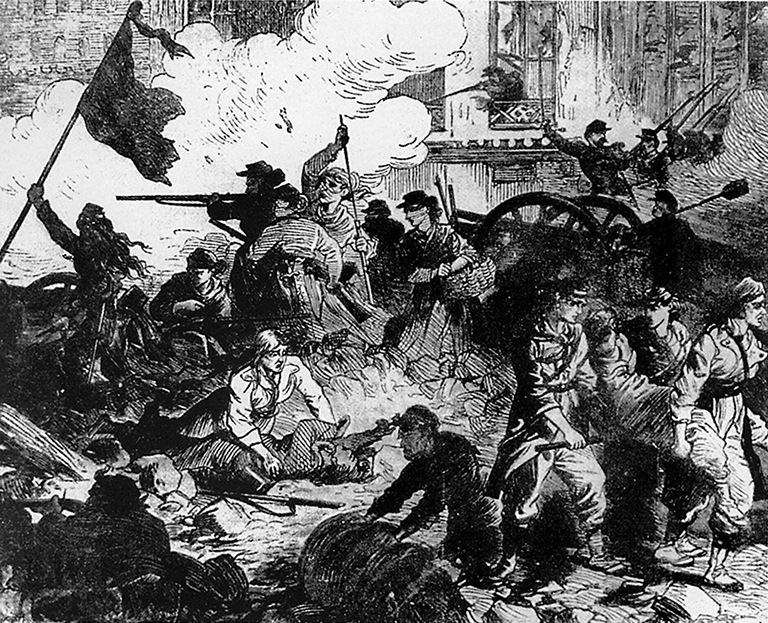 You can find out much more at The History of the Paris Commune. The site includes original photographs and and documents translated into English by Mitchell Abidor.